Who is Really Adopting Production Inkjet Printing Technology? Over the last few years, we’ve seen an increased emphasis on production inkjet printing technologies. But there are a lot of questions about the technology. 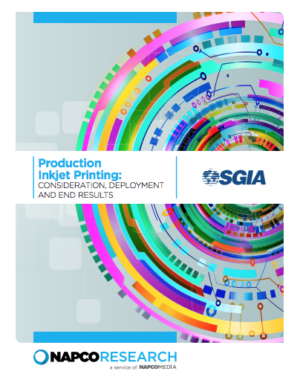 SGIA commissioned NAPCO Research to develop a study to know more about how production inkjet printing technologies impact print businesses. Over the last few years, we’ve seen an increased emphasis on production inkjet printing technologies. Touted as being “the next big thing” in the commercial print market, these presses offer high speeds, high quality rivaling offset, and an aggressive ROI. But there are a lot of questions about the technology. Who owns the presses? Why did these companies decide to adopt it? What was their deployment experience? How did it impact their businesses — both positively and negatively? How did clients accept it? In order to address these questions, SGIA commissioned NAPCO Research to develop a research study to explore the production inkjet market. In the summer of 2017, more than 700 commercial, direct mail, in-plant, publication, and transaction printers were contacted by NAPCO Research via online surveys and phone interviews to identify their first-hand experiences, challenges, and rewards regarding production inkjet printing technologies; why they have adopted continuous-feed and cut sheet production inkjet printing technology; and for those that have not, why not. About half of the printers surveyed own one or more production inkjet printing presses. Printers who own production inkjet printing equipment have been running the device(s) for years. About 80% of printers with inkjet printing equipment have owned it for a year or more, and 50%+ have owned it for more than three years, emphasizing how production inkjet printing has rapidly become an established industry technology. However, the type of production inkjet printing press purchased varies by market segment. Publication printers (mostly representing book printers) and direct mail survey respondents reported the highest ownership of continuous-feed inkjet presses at 75+%. Commercial and in-plant printers had a preference towards cut-sheet models, with both reporting 64% ownership, and with both also having the smallest ownership rate of continuous-feed presses, at about 50%. Overall, there was a somewhat higher ownership rate for continuous-feed presses, at 62%, than cut-sheet presses at 55%, leading one to conclude there are solid markets for both types of presses, but there tends to be a preference for one type over another depending on the segment and the print applications. Overall, printers in all segments are very happy with their investment with 86% being “Satisfied” or “Very Satisfied” with their move into this market. And if you add in the “Neutral” responses, the percentage grew to 99%. In addition to this high level of overall satisfaction, direct mail, in-plant, and publication respondents reported no dissatisfaction at all. Commercial and transaction were the only segments reporting any level of dissatisfaction at 3% and 4%, respectively. Mike Lincoln with the State of Colorado is so satisfied with their production inkjet printing technology purchase that they are looking to add a second line at some point in the future. But with all of these happy printers, why doesn’t everyone own a production inkjet printing press? Quite simply, it has to do with need. “Lack of Need” accounted for 70% of the reasons respondents gave for not considering production inkjet devices — and 40% of the reasons for not owning. Printers found deploying production inkjet printing technologies expanded their capabilities, enabling them to generate new business opportunities, reduce their costs per job, and deliver more consistent color job-to-job. Inkjet utilization, across all segments, came from three primary sources: more than half from digital toner and offset output migration, about a quarter from new business, and the remaining from other digital devices and other sources. Applications most commonly deployed on production inkjet printing presses closely followed the work each segment is best known for. While the addition of inkjet didn’t significantly change a printers’ product offerings, it did enhance their existing capabilities with lower operating costs, higher press speeds, reduced press downtime, workflow efficiencies, and other improvements. Want to know more about how production inkjet printing technologies impacted print businesses? You can read more about these findings, as well as view graphs, percent responses, and additional analysis in the complete study. Download a PDF of the report “Production Inkjet Printing: Consideration, Deployment and End Results” here.